Wow, is it really Friday again? It's so fulfilling for me to be able to keep in contact with you. It keeps the gears turning and the wheels on the bus going round and round. Guess what! I'm back in Surprise. I got back from St Thomas on Wednesday morning really, really early. You can find art wherever you land. Airports are no different. I was tripping through the Airport in Miami and thought I would snap a few photos of the airport floor. The Terrazzo floor is inlaid with brass representations of abstract sea creatures. Mostly coral and other sea plants. It is so inviting. 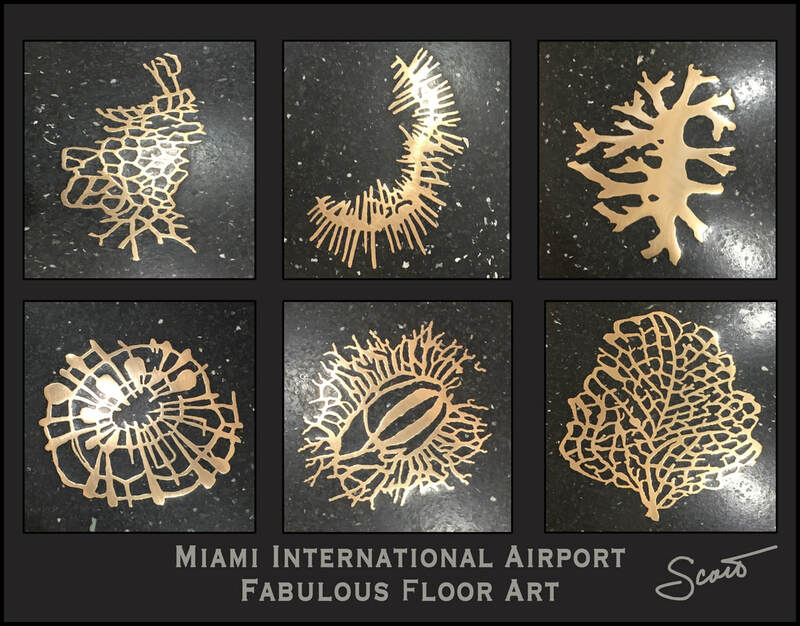 I really have to tip my hat to the folks that came up with this style of flooring for the Miami airport. It's really great. I had the mail on hold for the two weeks I was gone and when I got back I was so happy to see that my brand new liner brushes had arrived. They are so cool. I can't wait to get them out to practice. In the meantime, I've got lots to do. I've got a good friend coming to visit for five days or so. Andy and Margie are stopping by on a whirlwind tour of the Southwest. They're heading down from the Grand Canyon and staying over the weekend. I'm really looking forward to seeing them. By the time you get this email, they'll already be here. I started a batch of limecello on Wednesday. That's right - I'm making limoncello except I'm using limes. It's fabulous. It takes about a week to make. You can't rush perfection. We're cutting it close, the last batch is almost gone. I'm hoping to do a little chilling with my friends over the weekend. Thanks for being a friend and thanks for reading. If you have anything you'd like me to look at or write about, whether it's an artist or a topic, I'd love to know. I spend a lot of time scouring the web for the best and most inspiring artists. Art is a visceral thing. An artist or their artwork will connect with me or it won't. I suppose art is like that for everybody. The artist I'm presenting today has been working on the same project for the last fifty years. It's not the only thing he does but how many of us can say we've had that kind of sticktoitiveness with anything let alone a single project? Tom Philips came to my attention when the Royal Academy of Art dedicated an entire room to his work "A Humument" in 2015 at the Summer Exhibition. What struck me was each page of this book was an individual work of art. Each individual page was framed around the entire room. I was awestruck by the dedication, diversity, and the meticulousness of his renderings. He cuts, pastes, edits, collages, and draws on each page of "A Human Document" by William Hurrell Mallock. Tom Phillips provides a rather detailed overview of his lifelong work in this video. A copy of A Humument sits in my study. I look through it from time to time. It is inspiring work. You can discover some of his other works as well as a detailed history "A Humument" on his webpage. He's one of kind and I like his kind. Life is moving faster and faster lately. Have you seen a hummingbird while it hovers? My life seems to be whipping by faster than hummingbird wings. When you're a kid you don't think about the amount of time you have left in this place. Right now, I'm pretty sure I've seen more days behind me than I have in front of me. I have to face the facts. I'm giving a big wet kiss to 60 right now so I'm not even middle-aged anymore. If you're an optimist you can believe that you'll get about ninety years. My dad is going to be ninety this year. GO DAD! Mom didn't get that many years. I love learning about new things and learning about the world in general. One way I learn is to listen to podcasts. I love podcasts. I'm not what you might call a self-improvement junkie but I like to see if I can pick up tips along the way. I just want to know how I can be the best Scott I can be. I was listening to Nancy Davis Kho's podcast the other day. Hi Nancy! Her podcast and blog, "Midlife Mixtape", circles music and the middle years. Nancy talks about "thriving in the years between being hip and breaking one". I love that! Now that I've not in the middle years am I not allowed to listen to that podcast anymore? Again, my party, I'll listen if I want to. She has some great guests on her podcast. 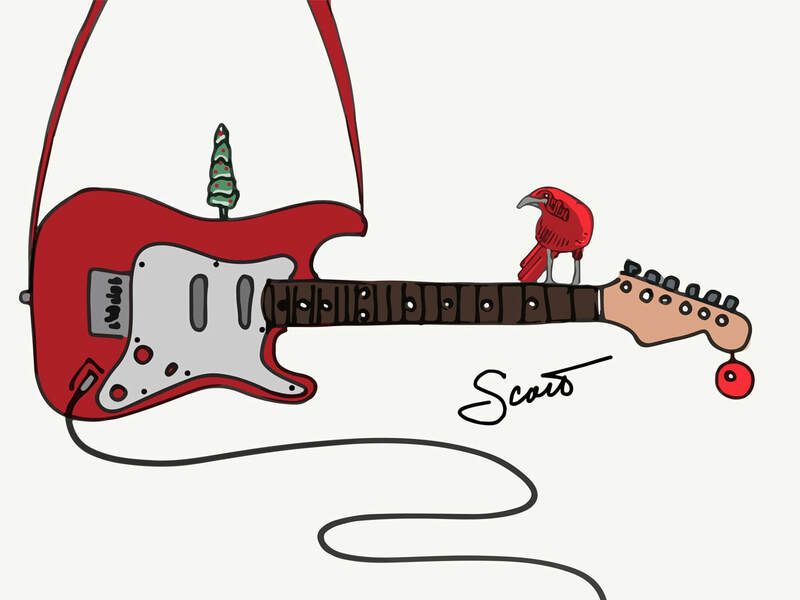 The last one I listened to involved a Chainstitch Wrangler called Kathie Sever. If you want to find out what a Chainstitch Wrangler is that a great place to find out! I love how Nancy always asks her guests "What was the first concert you went to and when?" My first was Peter Frampton, June 14, 1975, at San Francisco's Winterland and, yes, he did play "Show me the Way" but that's a whole 'nuther story. Fortunately, I haven't yet broken a hip. Unfortunately, I don't think I've ever been hip. I'm not quite at the finish line yet but I'm not the spry young thing I like to remember myself being. When you look at life with the middle years in the rearview mirror, you realize there are only a certain number bullets left in your magazine but unlike the rifle-range, reloading isn't an option. Some people measure those remaining years in the number of books that they can read, the places they can go, or myriad other things before the eyes dim and their living skills start slipping away. I've been thinking more in terms of paintings or artworks I can see or create before all my vigor has slipped through my fingers. Picasso created more than 50,000 artworks in his life. I haven't made the calculation yet but I don't think I have time to catch up. He had a bit of a head start. I'm not giving up though. I've been thinking about how I can maximize the years left. I worked out these five things that might help me get closer to being the best Scott I can be. First - Have a target because if you don't have a target you just float endlessly on the ocean we call life. But you can't make the target your master. Make the goal your slave not your master. If it doesn't serve you, change, modify, or get out of the way. Second - Do something every day to get where you want to be. Nothing happens without action. Again if you're not paddling - you're just floating. Floating is good sometimes. We all need some floaty time. Third - Realize I may never get there. Sometimes your target changes. Sometimes the target changes when you're in your floaty time, sometimes when you're right in the middle of something the target disappears, or sometimes well you just had the wrong target. In life, things change. That's part of the wonder of living. Fourth - Make time for fun. All work and no play makes Scotty Boy a dullard. I make time to play. Golf, Guitar, and Gazing at the stars. Oh yeah ... painting.